Ever get the feeling your seven month old infant is talking to you? Well, young infants do talk. Sort of. 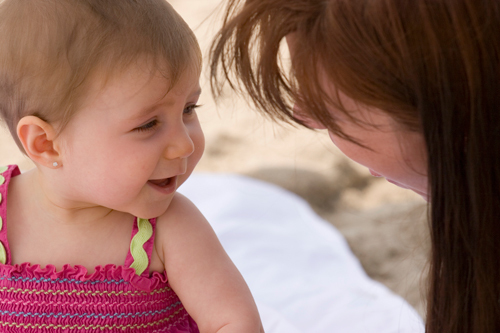 Even as young infants, children begin to develop vocal communication skills. Some examples of progress in this area follow as well as some strategies you can use to support this development. respond vocally to caregivers verbal interaction with back and forth interaction. copy the child’s sounds so they can hear you make some of the same sounds they make. So next time it seems like your child is carrying on a full conversation with you, go with it. Pretend they understand every word!